Fast growing evergreen shrubs are a homeowner’s best friend. Unlike deciduous shrubs and trees, evergreens hold their foliage all year long. That’s why people choose evergreen shrubs for privacy hedges and to shield unsightly sections of their own property. Because a privacy hedge is always something you want yesterday, evergreen shrubs that grow fast are the ticket. Here are some suggestions to speed you on your way. If your home is your castle, you might wish for some kind of a moat to secure your privacy. A privacy hedge is the modern equivalent and, if you select evergreen shrubs for privacy hedges, they do so much more than limiting access. A hedge is a row of shrubs planted in a tight line that protects your home from the indiscrete glances of passing strangers as well as curious neighbors. It not only insulates your home from open viewing, but it also serves as a sound barrier to reduce street noise. 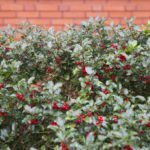 If wind is a problem in your area, using evergreen shrubs for privacy hedges creates windbreaks to protect your house and garden from harsh gusts. The taller the fast growing evergreen shrubs you select, the more wind protection they offer. Evergreen shrubs for privacy hedges can also protect against drifting snow, and mask unattractive views. Most gardeners planting privacy hedges want results as quickly as possible. They select evergreen shrubs that grow fast to encourage the hedges to take shape quickly. Which evergreens with quick growth work well in the backyard? You’ll have your choice among many. First, decide how high you want your hedge. Then select among the fast growing evergreen shrubs that grow to the height you want in the location you can offer. Tall evergreen shrubs with quick growth include American arborvitae and ‘Green Giant’ arborvitae. 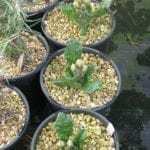 They are very popular for tree hedges. Both of these arborvitae can grow to 60 feet tall, and ‘Green Giant’ expands to some 20 feet wide. Be sure you want a hedge this tall before you plant, and check the city regulations on hedge heights. You can keep both of these shrubs shorter with regular pruning, but you may prefer to select a shrub with a shorter mature height. 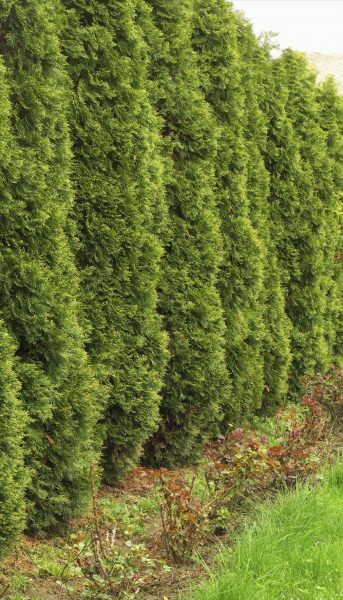 Leyland cypress is also among the most popular of evergreen shrubs for privacy hedges. It swiftly grows to 40 feet tall and 20 feet wide. If you want a shrub that grows to a height of between 20 and 30 feet, take a look at ‘Nigra’ arborvitae. It also accepts pruning so you could keep it trimmed shorter. 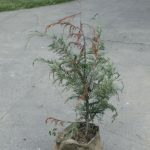 ‘Emerald’ arborvitae is about half that height when it is mature. It can be trimmed shorter too. Or try ‘Chindo’ viburnum, an evergreen viburnum that shoots up quickly. It reaches 20 feet tall and 10 feet wide within a few years.